"A ring on or touching the blue line is simultaneously in both of the zones bounded by that line and is playable by all eligible players." 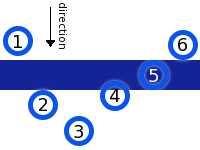 When the ring is on or touching the blue line, nearly any player may play the ring and carry it into either zone. The player who last touched the ring may only carry the ring back into the zone where they last touched it, or they can tap the ring to pass it into the other zone. In the image above, the player who last touched the ring may only shoot or pass rings 1,2,4,5 or 6 into the next zone. They may not play ring 3. Any other player may carry rings 2,4,5 & 6 into either zone, and can play rings 1 & 3 normally. Congratulations to the Eastman Flames U14AA team who brought home the silver medal after competing in Wood Ringette Tournament held in Edmonton during November 23 to 25. The Flames were very strong in each of the four round robin games they played, went undefeated with a record of 3 wins and 1 tie, and finished first in their pool. Although the Flames lost in the gold medal game to a very good team from Calgary, they should be proud of how well they played against some of the best teams in Western Canada. Eastman's U16A Heat team donned breast cancer jerseys during the BVRA pre-season tournament to help raise Breast Cancer Awareness. Off the ice, the players were busy soliciting donations from neighbours, family and friends to help in the battle against Breast Cancer! The team was able to raise $783 towards the fight! Eastman's U16A Heat team was busy on Halloween but not for what most of us would think. Instead of trying to fill pillow cases with an assortment of Halloween goodies, they were busy collecting non-perishable food items in Lorette for the local food bank. A big thank you to the U16A Eastman Heat team for giving back to the community and making a difference. The annual Eastman Flames AA tournament is over for another season. Both Flames teams (U14AA and U16AA) medaled during the tournament. The U14AA Flames had a very strong showing during the tournament and finished second in round-robin play. During the medal round, the U14AA Flames faced the Buffalo Plains Rush and were victorious bringing home the gold medal. The U16AA Flames also had a strong showing during the tournament and finished second after round-robin play. During the semi-finals, the U16AA Flames lost to the eventual gold medal winning Angels team in a close game. During the medal round, the U16AA Flames faced the Wild team whom they had lost to during round-robin play. The Flames had a very strong game and ended up winning the bronze medal. Congratualtions to both Flames AA teams for having a successful tournament and good luck during the upcomng AA season.